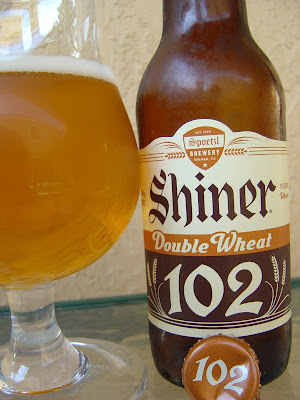 Today I'm drinking Shiner 102 Double Wheat brewed by the Spoetzl Brewery in Shiner, Texas. This one commemorates their 102nd anniversary. I looked around a while, but it seems I missed anniversary 101. I did, however, catch number 100. There is a little story on the back, which I'll let you read in the photo below. That white messy sticker was the result of my trying to peel off the price tag that Total Wine felt the need to put on there. The front label says, "Malty Sweet. Filtered Wheat"
Malty and grain aroma. Sweet corn flavors along with plenty of toasted, buttered bread. Wheat texture and flavors are also prominent. Plenty of carbonation and medium body are both right on the mark. The initial sweet flavors are balanced toward the end with a light bitterness. You finish with a nice aftertaste. Simple and flavorful. 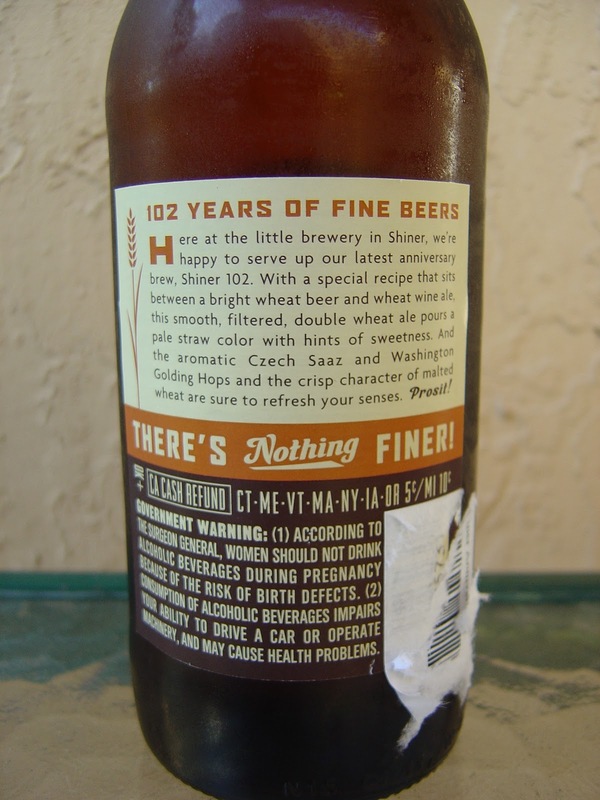 This review is typical of most of Shiner's beers. Yes, they are very similar and have a distinct flavor characteristic. Check it out if you don't believe me! Enjoying one now. Very good!! Drank my first one last night, great beer.Looking foward to touring the brewery soon. Sounds fun, let me know how it goes.